Despite what I tell my husband and step-kids, I’m not always right. Case in point: In 7.5 years of having a job that requires me to experience everything Bend has to offer so I can tell other people about it, I’ve occasionally….misjudged. Like I’ll hear about a new experience and think, “Meh, that sounds okay, but nothing to get excited about.” Sometimes I’ll hold on to that thinking for a shamefully long stretch before actually trying the thing myself. And then I’m forced to admit I was totally wrong, and that the activity or attraction is infinitely cooler than I gave it credit for. Here are three examples. My thoughts were ho-hum when I first heard about this adventure game where participants are placed in a room and have to use teamwork to find clues, solve puzzles, and escape the room within a set time limit. It sounded fine and all, but this is Bend—why would I want to be locked inside? Guys, I was so wrong on this one. 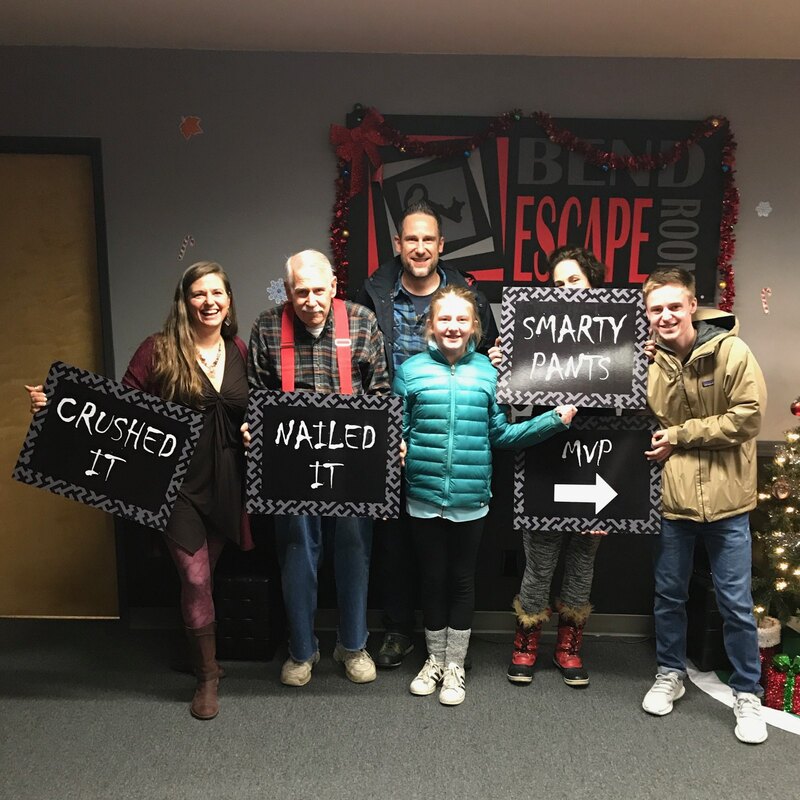 Blogger Tawna (left) and her family after successfully freeing themselves from a Bend Escape Room. First of all, an hour is no great sacrifice in the grand scheme of how much time you’re spending outdoors. Second of all, the Bend Escape Room experience is so much cooler than you think it will be. I had the pleasure of doing it with my extended family, which included my father-in-law, husband, sister-in-law, and two stepkids (ages 12 and 16). In other words, a true multigenerational affair. With the clock ticking, everyone scrambled around the room overturning furniture, assembling puzzles, trying different lock combinations, and using creative problem solving to find clues. Everyone had a different way of approaching things, and it was fascinating to see the wheels turning in the brains of people I thought I knew well. Each family member brought something to the table, and it was one of the coolest family bonding experiences we’ve had together. We successfully solved the puzzle with just over a minute remaining, and afterward we stood in the parking lot for thirty minutes gushing about how much we loved it and how excited we are to pick one of the other challenges and do it again. There’s an FAQ on their website that explains more about the rules and how appropriate it is for different ages and group sizes, but I urge you to give this one a shot if you’re looking for a fun family or team building experience. I leapt to some very wrong assumptions when I first heard about Float Central. For those who don’t know, floating is a wellness technique that involves slipping into a tank filled with about 11-inches of water saturated with Epsom salts. The buoyancy of the salt water keeps you afloat in water that’s heated to skin temperature, so you basically lose track of where your body ends and the water begins. Wrong assumption #1: Won’t the water be icky with all those people floating in it? Uh, no. You’re in a private float tank by yourself, and the entire volume of water within the tank is filtered and passed through a UV system after each use and treated with an environmentally friendly hydrogen peroxide solution. They also don’t allow shoes beyond the lobby, and showers are mandatory before you float. In other words, this place is so clean you could eat off the floor. Ahhh, floating…way cooler than you realize. Wrong assumption #2: I’m going to feel claustrophobic closed in a water-filled tank. Wrong again. The staff at Float Central knows some people are a little freaky about this, so they carefully coach you on options to help you feel safe and relaxed. You can leave the tank door open if you want. You can try two different types of earplugs if you’re worried about water in your ears. You can use a little floaty pillow if you want extra head support. Trust me, these guys have encountered every possible phobia you might have, and they’ve devised a solution that’ll help you relax. So now that I’ve dispelled some of my own inaccurate assumptions, I’ll tell you what’s amazing about the experience. Floating is one of the most relaxing, soothing, out-of-body kinda experiences I’ve had. I am not someone who relaxes easily, or who is capable of shutting off her brain for any length of time, so when I tell you I actually zoned out during my 90-minute float, it means something. There was something unbelievably peaceful about having no sounds, no sights, and no work required to keep my body afloat. Just calm, warm, soothing silence. So yeah, floating? Way cooler than I thought it would be. For the cost of a $5 NW Forest Day Pass, you can do a self-guided tour of Lava River Cave, exploring a mile-long lava tube between May and October. For the price of a couple beers, you can get a decent taste of the Bend Ale Trail all on your own. Get a personalized, guided tour of one of Central Oregon’s amazing lava tubes with Wanderlust Tours. So why would someone pony up $75 for a Lava Cave Tour or a Bend Brew Bus outing with Wanderlust Tours? Hoo boy, where do I start? 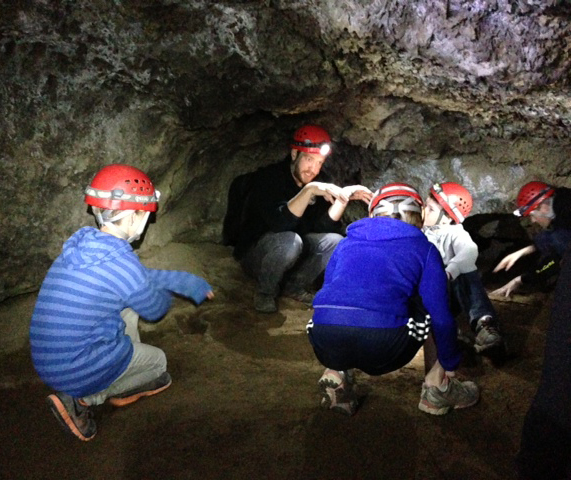 Let’s start with cave exploration. Yes, the Lava River Cave is neat, and if you’re short on cash, it’s a decent way to get a taste of Central Oregon’s amazing lava tubes. But with thousands of people passing through during peak season, it can feel more like a Disneyland attraction than a spelunking adventure. By contrast, Wanderlust is permitted to explore caves that no one else can access. Want to see the spellbinding, rustic, super-unique Skeleton Cave? There’s no way in except with Wanderlust, so this is truly one of those once-in-a-lifetime gigs. And your naturalist guide knows everything (I do mean everything) about the history, geology, and science behind the cave systems. Your fees not only include his or her knowledge and guidance, but transportation and gear, including a helmet with headlamp because you’ll be exploring some nooks and crannies that you’d never get to experience with a more sterilized, solo cave visit. Now, let’s talk Bend Brew Bus. Sure, you can hit the Bend Ale Trail on your own, but you won’t get behind the scenes. You won’t have personal conversations with the brewmaster or sample beers that might not even be on the menu. You won’t get a back-room tour of the brewing equipment or learn exactly what goes into making the beers you’re sampling. If you’re on your own, you won’t get free appetizers at one of your stops (they’re included on your Bend Brew Bus outing). But most importantly, the Bend Brew Bus ensures you have a safe and sober ride to and from your hotel or vacation rental, and transportation between all four breweries you’ll be visiting. That right there is invaluable, since a DUI will cost you a heck of a lot more than $75. Now get out there and try something new.